If you'd like to learn how to make homemade soaps that will have your skin feeling refreshed, radiant and oh so smooth, create romantic homemade candles that will bring joy and harmony to any home or create unique and delightful bath products that will have customers craving for more, then this might be the most important letter you'll ever read. 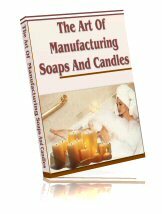 The "Art Of Manufacturing Soaps And Candles" is packed with so much wonderful information to help you learn these wonderful crafts you'll find yourself creating wonderful soaps and candles that will amaze your family, friends and even those that may not be very friendly towards you! Learn about the history of soap and candle making, view illustrations of the top machines used in the late 1800's for making homemade soaps and candles, and relive a part of history as you read information shared by some of the leading soap and candle manufacturing experts of the late 1800's! This 126 page eBook is so jam-packed with information, you'll be hard pressed to find all this valuable information in a single publication elsewhere. Some of this information is available nowhere else! Order today for only $5.95! © Copyright 2008, http://www.recipes4success.net All rights reserved.